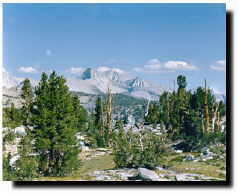 We proudly operate under a special use permit from The Sierra National Forest. PLAN YOUR HIGH SIERRA PACK TRIP NOW! Take a nice back country horseback ride. Located only about a mile from Edison Lake, we also accommodate overnight and longer pack trips into the many lakes and streams surrounding the lake. 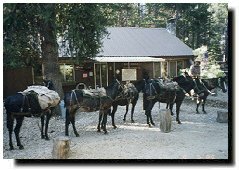 SPOT TRIP - Packer takes party to campsite, 3 to 4 hour riding time, and returns to the station the same day. You are charged for packer and stock one day to take you in and one day out. OVERNIGHT SPOT TRIP - Packer takes party to campsite, 5 to 6 hours riding time, remains overnight with the party, returns to the station the next day. He returns the day before your date to be brought out. You are charged for packer and stock two days to take you in and two days out. CONTINUOUS TRIP - Packer and stock remain with party for entire trip. Party may take side trips from a base camp, or may travel and move camp as desired. You are charged per day for packer and each animal. ALL EXPENSE TRIP - We furnish all the food, livestock, packer and cook. You bring just your personal gear and we'll take you to a destination of your choice. There is a 5 person, 4 day minimum on these trips. DUNNAGE, BACKPACKS OR FOOD DROPS - Backpackers and hikers delight! Let us carry those heavy backpacks and that extra food. Ride a horse or hike along. 1 packer and 1 pack animal minimum charge. 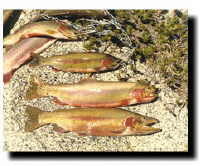 GOLDEN TROUT - Call about these fishing trips. GUIDED HORSEBACK RIDES - 1/2 DAY - Leave our station at 8:00 A.M. and return 12:00 Noon. 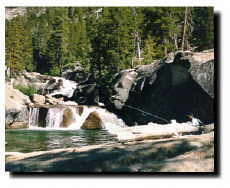 Or leave at 1:00 P.M. and return by 5:00 P.M. See a bit of our back country the easy way! ALL DAY HORSEBACK RIDES - Take your family or friends on a full day ride or fishing excursion. Leave our station at approximately 8:00 A. M. and return by 5:00 P.M. PER DAY per riding or pack animal. PER DAY per riding packer and his horse. A packer is required for all pack trips. Each packer handles a max of 10 head of stock. A guide is REQUIRED for all rides. Cost of guide is included in rate. Reservations with deposit covering first day's charge is required. Load Limit-150 pounds per pack animal. Food, Camp Equipment, Supplies furnished by party. Party provides meals for packer on overnight and continuous trips (Supper, Breakfast, Trail Lunch). IT IS ACCEPTABLE TO TIP YOUR PACKER.